After years of various ball sports, Bryn discovered running during high school, realizing what she was best at and enjoyed most in all of those ball sports was the running part. Once she acquired a taste for the sport she pursued it with great aplomb continuing to compete at Marist College, where she was a Division 1 Cross Country and Track athlete. After graduating and moving to New York, Bryn missed the camaraderie of a team, as well as the social aspect of the sport she loved. 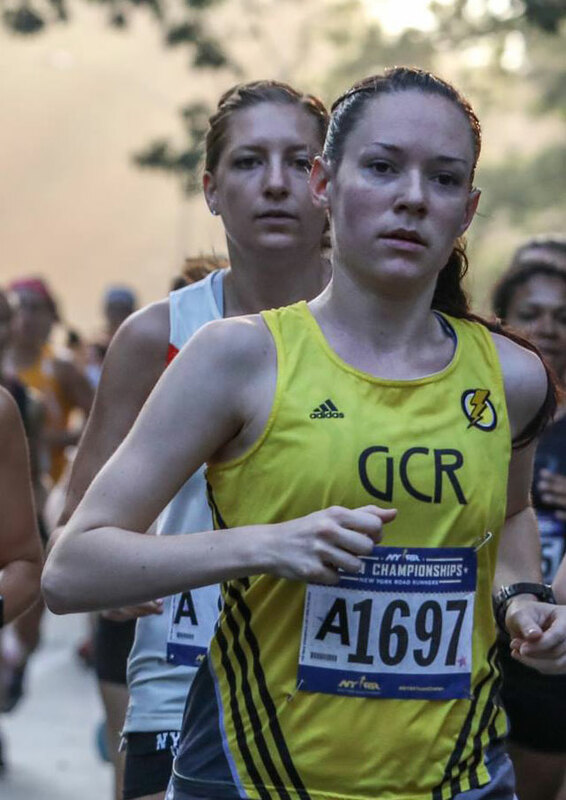 Running solo was becoming monotonous and predictable, which prompted her to join Gotham City Runners in the beginning of the 2018. A fixture in the early hours of the morning, Bryn loves attending morning practices with her teammates, post-race brunches, and taking to the streets to cheer when she’s not racing. John Kuehn Jr. began running as part of his school’s mileage club in 5 th grade and simply hasn’t stopped running since. A four year varsity distance runner in XC, Indoor Track, and Track & Field, he kept running into college by becoming the manager of the NCAA D1 Women’s Track Team at St. John’s University, and also co-founded/competed for the NIRCA affiliated St. John’s University Track Club. This club team gave an opportunity to run and train at the collegiate level at a school without a men’s track team, and has since grown to be one of the most competitive collegiate club track teams in the country. During his time in school, John found a passion for road racing which led to road PR’s in everything from the mile through the half marathon, and a marathon debut at the 2016 NYC Marathon. He is currently training to specialize in the half marathon. Nowadays, John is competing for Gotham City Runners as the acting Men’s Team Captain. A strong proponent of team competition and camaraderie, John was a part of the 2017 GCR Men’s Team that won the C-Division Championship in the NYRR Team Points Club Competition. If he’s not running in Central Park, you can usually find John watching some pro track meet, trolling the LetsRun forums, or grabbing a beer at Coogan’s after a workout at The Armory.